3 | 359 students enrolled. Certification in Online Derivative Analytics course is jointly certified by NSE Academy & Elearnmarkets (NSE Academy is a subsidiary of National Stock Exchange of India). Derivatives Analytics are one of the chief drivers of financial markets in modern world. Although it has been largely criticised, the fact remains that it offers tremendous opportunities due to the inherent fund leveraging. Certification in Online Derivative Analytics is essentially analysing various derivative parameters to get indication of market expectations. This course will equip the participants to analyse various derivative criterions like Open Interest, Price OI relationship, Roll Over statistics etc and get confirmation for the market movements. The focus of Derivatives Analytics course is to introduce and train the market participants about various derivatives tools which would give additional analytic information for better decision making. This analysis will complement technical and fundamental analysis on markets thereby providing a complete package. It gives you a basic understanding of put options and call options too. Students enrolling for this programme will be given a “Certificate of Completion” from NSE Academy facilitated by Kredent Academy, after successful completion of Derivatives Analytics course. He shall also be given free access to related webinars conducted by Kredent Academy for further knowledge enhancement. An email query support, Question & Answer community platform will also be availed by the student for any kind of doubt clearance related to content while pursuing the course. Market participants who are serious about making money from market. 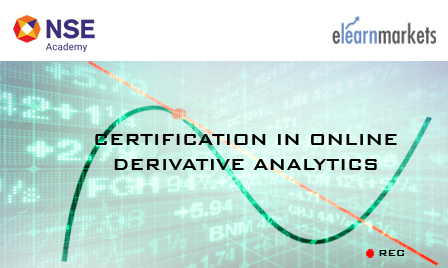 Under this course “Certification in Online Derivative Analytics”, the participant will be required to appear for the online examination hosted on the website of Elearnmarkets.com. Please note that the participant will get the Certificate of Completion of Certification in Online Derivative Analytics after successfully clearing the online examination. After successful completion the online examinations, participants can download their certificate from "My Certificates" tab available on Elearnmarkets dashboard within 10 days from the date of Certificate application done.